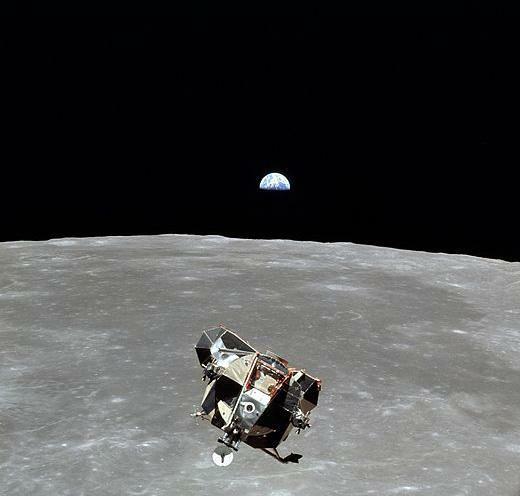 Time-Lapse Video: A Quarter Million Miles and Apollo 11’s Michael Collins. Only one human being alive on July 21, 1969 is not in this picture. Today is the anniversary of the first time humans set foot upon another world. Michael Collins, Buzz Aldrin, and Neil Armstrong lifted away from Earth on July 16, 1969, and on July 20, 1969, Aldrin and Amstrong effectively sliced all of history into two different halves. Collins represents an interesting paradox. While he was one of the three Apollo 11 astronauts to go to the Moon, he didn’t walk on its surface. His task was to stay in orbit, on board the Command Module, while Armstrong and Aldrin cavorted upon the lunar surface. Some people feel sorry for him, getting almost all the way to the Moon but denied the opportunity to land there. But he also had a singular opportunity: He became the farthest man in the Universe. When he circled the far side of the Moon, the nearest people to him were thousands of kilometers away, and ignoring them, the rest of humanity was 400,000 kilometers distant. A quarter million miles. Lovely! The music is sweet, but still with a hint of loneliness to it. The emotional sway of the music makes the connection to Collins more palpable. This is the first of several pieces by Lacey, and I’m looking forward to seeing the next. As for Collins, a little while back a picture circulated the ‘net (shown at the top of this post). It shows the Lunar Module carrying Aldrin and Armstrong returning to orbit, about to rendezvous with the Command Module carrying Collins. Perhaps that won’t always be true; there will come a time when a picture of the Earth doesn’t encapsulate all of humanity. But for now it does, and while we can’t all experience the feelings Collins had at that time, perhaps, on this day, one of greatest of all anniversaries, the music by Lacey can help us understand them.